Unifying disparate storage and data networks is a natural progression in many virtualization and cloud deployments. 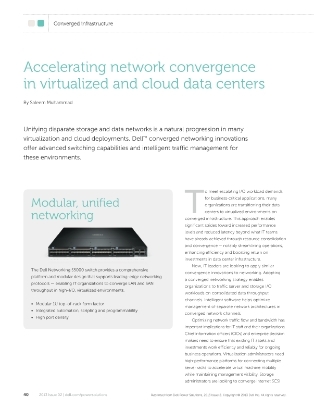 Dell converged networking innovations offer advanced switching capabilities and intelligent traffic management for these environments. In this white paper, you will discover an innovative unified storage switch that provides a comprehensive platform and modular design that supports leading edge networking protocols – enabling IT organizations to converge LAN and SAN throughput in high I/O, virtualized environments.